The game ‘Gilli-danda’ dates back to the Maurya dynasty in India, which was around 320 BC. This game is believed to be the origin of European and American games like Cricket and Baseball. This is a very popular game played in the Indian subcontinent. Pallankuzhi is a traditional ‘sowing’ or ‘count and capture’ game played in South India. This game is played on a wooden board using shells or coralwood seeds. This is a 2 player game with 14 pits in the wooden board, 7 for each player. As the game proceeds, each player distributes the shells over the pits one by one until his hand is exhausted and takes out the shells in the pit where he finished. There are several rules on how to capture a pit and techniques on how to prevent you opponent capturing your pit. This game was used to teach kids the basics of counting and improved hand-eye coordination. This used to be a pretty popular game which I played in childhood. Sadly, it is slowly fading away due to the advent of modern games. It is still played in rural India. Wolfenstein 3d is the game that is credited with establishing the First Person Shooter genre. You play an Allied spy during World War II and go around mazes, castles and bunkers in Nazi Germany fighting the Schutzstaffel, finally facing off with the Fuhrer himself. One of the major reasons for the popularity of the game was that it was released as Shareware. I was pleasantly surprised to find an online browser version of the game. After all these years, it still feels great to play Wolfenstein 3d. What if an NPC realizes that it is in a game! What if a Non- Player Character realizes that it is in a game? Here is a post from Steve Yegge where he draws parallels between a game (an embedded system for all means and purposes) and life. This is about the frontiers/ barriers that a game offers to its in-game characters and how a similar barrier is present in our Universe. This is a robot- programming puzzle game. I like this game because it allows you to use programming concepts and build a set of commands to make a robot move in a specific pattern to achieve game objectives. Once you’ve written the set of commands, you can immediately see the robot in action, executing your commands. I think this is the cool part of the game – you get to see your program in action quickly. This game is similar to the classic ‘Dangerous Dave’ game. The objectives of the game are straightforward: You are a ninja. Your objective is to find the key and open the door to the next level. While the controls to make the ninja move are simple, you need to master them to finish the level before the timer expires. Simple controls and challenging game play make this game very addicting. This is one of the things I like about this class. On a regular class, you read papers and you get asked questions about them in tests. But not here. That would be too mainstream and you do not commit such blasphemy in Design Games class. We get to make awesome videos showing our understanding of the papers. We had fun doing the video and I think we understood the paper more than we would have, if it had been for just a test. 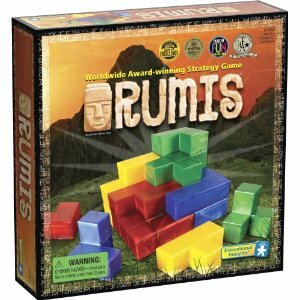 Rumis is a board game in which each player is given a set of 3 dimensional pieces and the players have to construct different buildings based on the maps they are playing. There are specific limitations on the height of each block in the map. No two pieces proved to the player are of the same shape and each player can only place his piece adjacent to a piece of his own color. There are several interesting points about this game which we have captured below. This game teaches you planning and spatial reasoning. There are different maps available which present different sets of challenges. No two games are similar because of the large number of possible combinations. The learning curve required is somewhat steep compared to other board games. A player could do an illegal move and be unaware of it if the map size is large. This is because the rules are written down on the board which gets covered by the pieces as the game progresses. Ability to design your own piece. We could ask each player to design his own piece in advance before the start of the game to add in the player’s creativity into the game. Use magnets for the blocks so that they dont fall off the board. The blocks fall off beyond a certain height. Old people or young kids with not so good dexterity cannot play this game. In a game with more than 2 players, players could easily gang up and block another player from making further moves. We could use motion control systems like Kinect to recognize gestures. We could then use these gestures to turn the pieces around, rotate the board and place them at the required position. We could allow players to generate custom maps. We could create an online forum where we could let players share their maps. The maps would be ordered on difficulty based on player feedback. Players could compete on the points scored by winning the map. An illegal move would be easily prevented by the computer. The computer calculates the winning criteria. Right now the counting has to be done manually. We played the game “Gobblet”, which was real fun. This is essentially a 2 player game, played on a 4*4 square, with players taking turns to make their moves. Each player is given 12 pieces. They pieces themselves are hollow and of different sizes. They are stacked into three groups of 4 pieces each. 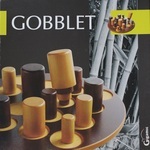 As each player puts his piece on the board, the other player can either choose to “gobble” the opponent’s piece if it is smaller than the piece he has, or put it on a separate square. The objective of the game is to get 4 pieces of the same color in a row. An important feature of the game is that each player can only play the exposed pieces first. We found that the game was strong on many counts..
– This is a strategy based game and not based on luck. This makes it a good choice for those who want to play a game which tests your intelligence. – Gobblet provides equal opportunities to both players. – Good exercise for brain as you need to plan many moves in advance and predict your opponent’s moves too. – Each game can have only a finite number of moves. Since the games are short and intense, you can potentially play the game a number of times, with each player getting better with each game. – The number of players is limited to two. The game could possibly be improved by adding another player with another color on the board. – Although the game is strategy based, after playing the game with the same player for a couple of times, you start predicting the opponent too well. We felt that the game lost its edge there. – Can be played on a larger area with more squares ( This one was 4 X 4). Other thoughts on improving the game include having a third dimension( 4 x 4 x 4) and playing with more pieces. – Can probably have a way to include more than two players. – Just like Sudoku or Chess, this could be a potential game to keep old brains smart. It keeps you thinking on your feet. – We could add a random element (say a dice throw to limit the size of next piece that a player can move) to the game to make it more interesting and keep experienced players guessing. – Two players playing again and again with each other will start understanding the most likely moves of each other, making the game predictable. With a computer, you could potentially generate a large number of gobblet arrangements on the board and present it to a single player and ask him to predict the smallest number of moves with which he could win.